A shining example of stylish neckwear. 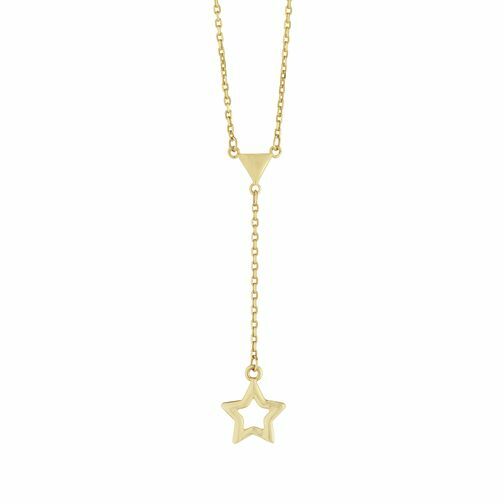 This stunning star necklace is made from 9ct yellow gold, presented upon a lariat style yellow gold chain. An upturned triangle presents an extra fashionable touch, with a singular lariat chain proudly holding the star outline, the spotlight stealing feature. This necklace is 17" in length, with an additional 2" lariat chain for the star. 9ct Yellow Gold Star Lariat Necklace is rated 5.0 out of 5 by 1. Rated 5 out of 5 by Anonymous from Very feminine Really like this necklace, very difference. length is perfect.